Thanks so much for your support and business throughout 2015. We're really excited about our plans for the New Year and we'll be sharing these with you in a newsletter in January. Our Support Desk (0845 612 2402) is open every day through the holiday period (other than the Bank Holidays) to support you and your staff so do call as normal if you need help. We hope you have a great break and a very healthy, happy and prosperous New Year. Speak to you in 2016! PS as usual, instead of buying Christmas cards, we've donated to our local Community First Responder group (Robin is a CFR himself). Hope you approve! Surveyor dictation facility in Tracker Mobile gets a "wow"! We've been training lots of new asbestos surveyors this week to use our Tracker Mobile and Alpha Tracker asbestos software systems. One feature - the ability to dictate notes into Tracker Mobile - got a "wow" from the audience! Following on from the update to AlphaValidator we released at the start of December, we've just made v1.0.69 SVN24 available with a new data check. We've had a busy week training new asbestos surveyors (see http://robinbennett.blogspot.co.uk/2015/12/alpha-tracker-training-underway-at-acs.html and http://robinbennett.blogspot.co.uk/2015/12/central-demolition-go-live-with-alpha.html) and during the training we often get prompted to make improvements to our Alpha Tracker asbestos software or Tracker Mobile on-site handheld surveying module. One of the suggestions this week was to add a data check in for areas of no access that had been recorded without associated reasons or notes - great idea! If you need help to install the update, please contact our Support Desk. World-renowned asbestos specialists ACS Physical Risk Control have completed their initial Alpha Tracker training at their offices in Glasgow. ACS offer the full complement of professional, technical and training support required to protect their clients against liability and to achieve best practice in risk control. 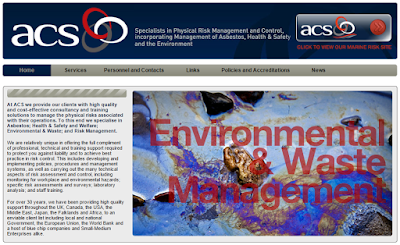 This includes developing and implementing policies, procedures and management systems, as well as carrying out the many technical aspects of risk assessment and control, including monitoring for workplace and environmental hazards; specific risk assessments and surveys; laboratory analysis; and staff training. For over 30 years, they have been providing high quality support throughout the UK, Canada, the USA, the Middle East, Japan, the Falklands and Africa to an enviable client list including local and national Government, the European Union, the World Bank and a host of blue chip companies and Small-Medium Enterprises alike. We're delighted that ACS have chosen Alpha Tracker to be their software system of choice and we look forward to working with them over the next few months to get all of their staff and processes up and running. Kim & I have really enjoyed today's training sessions at Central Demolition, the Bonnybridge-based asbestos specialists. 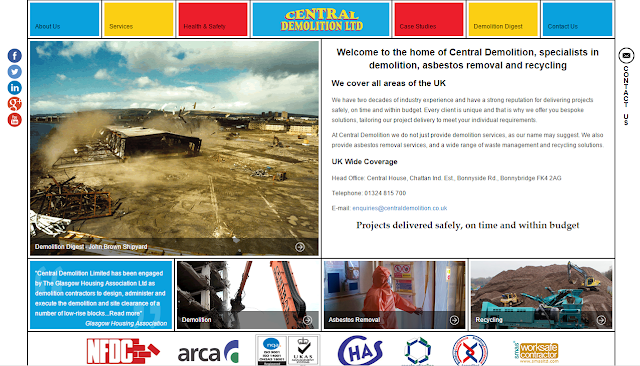 Central Demolition is a demolition, asbestos removal, asbestos surveying and recycling contractor serving clients throughout the UK. The business was established back in 1993 and has been thriving for the past two decades. They are members of the National Federation of Demolition Contractors (NFDC) and the Asbestos Removal Contractors Association (ARCA), hold a wide range of other memberships and accreditations and are multiple award winners. A key factor in their success has been their continued investment in skilled personnel, training, facilities and equipment and Alpha Tracker is their latest investment to improve the service they provide to their clients. We welcome the asbestos surveying professionals at Central Demolition to the Alpha Tracker family and look forward to a long relationship with them. Am I on the latest Alpha Tracker release? Does it matter? I've been calling customers this week to tell them about the amazing new features we've introduced into our asbestos software system Alpha Tracker over the last few months... and what is coming up in the November/December release. The response is often "Aren't we on the latest release? How can I tell?". Fair question! This one shows SVN1748. If you check your own version, are you some way behind? So does it matter if you are not on the latest one? You'll be missing out on new features and performance updates but you are perfectly entitled to stay on any release you want. The updates are free, of course, and they do help us to help you (as we fix bugs along the way, too), so we'd generally prefer you stay up with the latest versions if you can. Hope this info helps and makes sense. Do contact us on the Support Desk on 0845 612 2402 (24 hours a day, 7 days a week) for more info. Asbestos consultancy Ness Asbestos has gone live with the Alpha Tracker asbestos software system from Start Software. 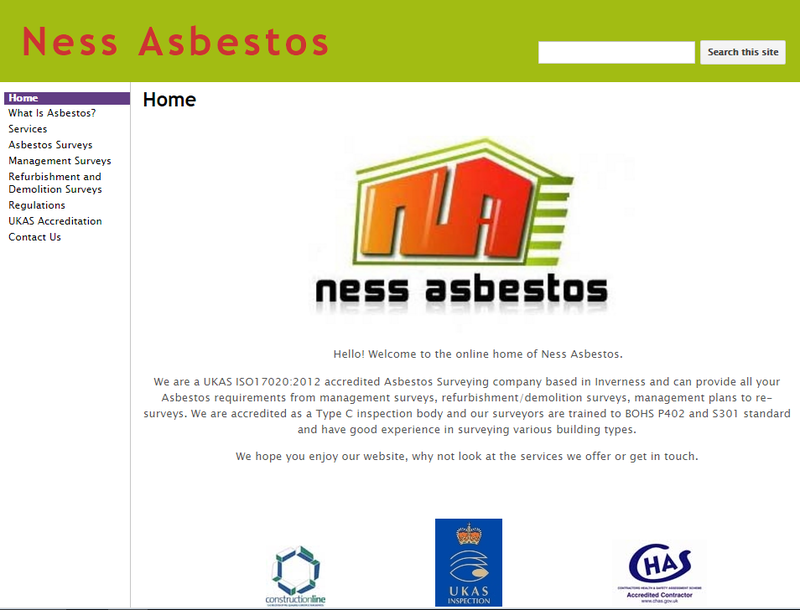 Ness Asbestos are a UKAS ISO17020:2012 accredited asbestos surveying company based in Inverness and can satisfy the complete range of asbestos requirements from management surveys, refurbishment/demolition surveys, management plans to re-surveys. They are accredited as a Type C inspection body and their asbestos surveyors are trained to BOHS P402 and S301 standards and have extensive experience in surveying various building types. Our trainer Kim has been in Inverness to train the Ness surveyors in the use of the back-office software as well as the handheld surveying application, Tracker Mobile. Using Alpha Tracker should massively reduce the admin time necessary to produce asbestos reports whilst increasing consistency of data collection and reporting. Use of the handheld data capture app Tracker Mobile (on Android or iOS smartphones or tablets) will enable sample data, photos and plans to be sent back to the Alpha Tracker cloud direct from site. Our Support Desk has published its call stats for November. During the month they answered 399 calls for help and 89% were resolved in the mutually agreed time-scales. That's within a whisker of our 90% target. Congratulations to Jack and the team for another good month following on from the excellent October results. Robson Environmental Pty Ltd have gone live with asbestos and hazardous material software management system Alpha Tracker after receiving training from Alpha Tracker consultant Judy Key. Established in 1990, Robson Environmental Pty Ltd services clients throughout Australia and overseas from their office in Canberra. Robson Environmental's customer service and quality focused multi-disciplinary environmental consultants provide Occupational Health and Safety (OHS) training, job safety analysis services, asbestos testing, environmental risk assessment and management expertise and services to residential, government, commercial and industry clients. Robson's expertise has enabled Start Software to expand the range of data collected and processed by Alpha Tracker to include a wide range of hazardous materials. 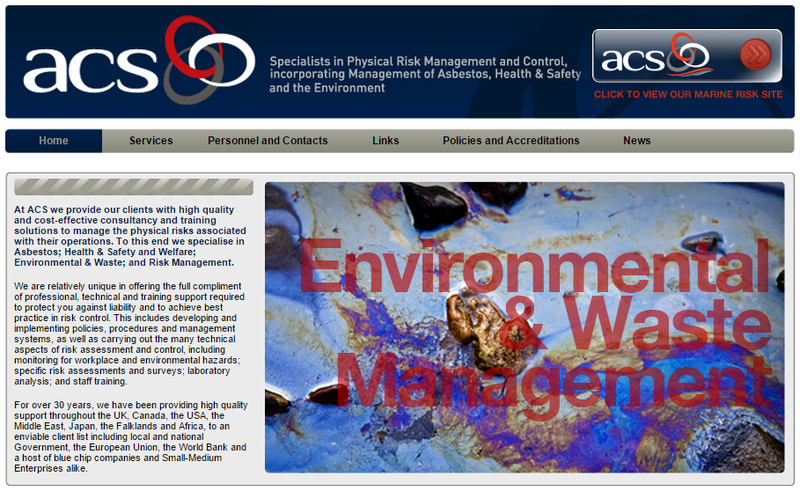 Can we help your asbestos, environmental or hazardous materials consultancy to streamline and automate your business? Get in touch if we can. Kim was back on site at asbestos consultancy Euro Environmental on Friday to help with their weekend switch-over to asbestos management system Alpha Tracker (see http://robinbennett.blogspot.com/2015/10/euro-environmental-switch-to-alpha.html). It's great to see new asbestos survey projects flying in and out of the system - welcome on board Euro! 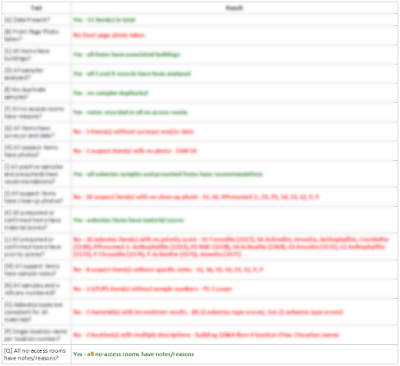 It has been a while since our asbestos data checker for Alpha Tracker has been updated (see http://robinbennett.blogspot.co.uk/2015/02/alphavalidator-v1061-svn21-released.html) but thanks to a nudge from a client (CJ... you know who you are!!) 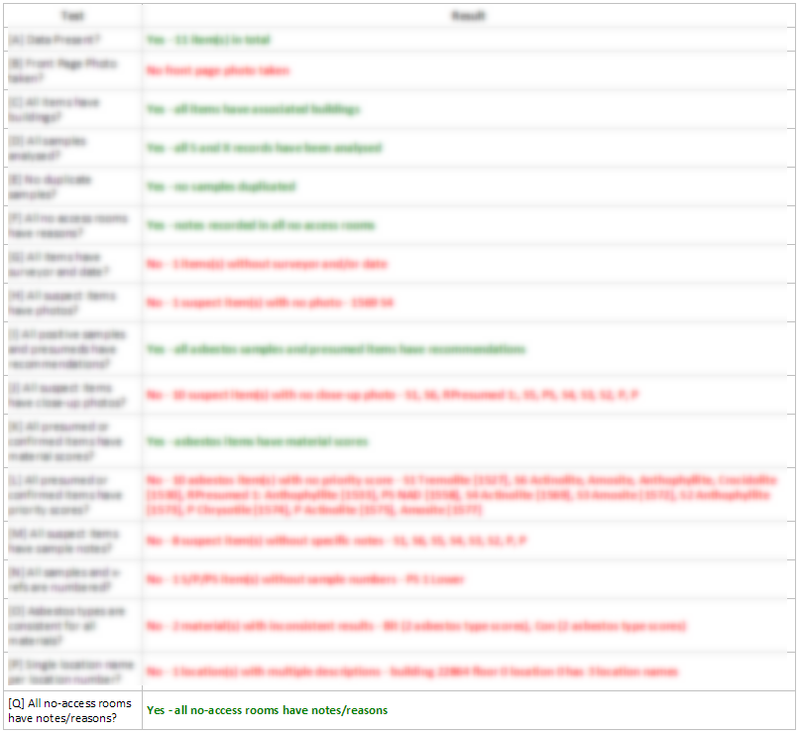 we've improved some of the data checks and released v1.0.67 SVN23. This is available for immediate download from http://www.start-software.com/tracker/modules/alphavalidator/ - give us a ring if you're not sure how to update your system.